William J. O. Bremer was born on August 20, 1913, the last of three children to Charles, a stationary engineer, and Sophia Bremer, a homemaker. They lived in St. Paul, Minnesota. Bremer’s parents were both second generation citizens from large German and Eastern European families who resided in the St. Paul area since the 1860s. When William was six years old, both his mother and his nearest sister, Marie, died unexpectedly. By 1920, the grieving family was split; William lived with local relatives separately from his father and older sister, Henrietta. After attending St. Mark’s Catholic School for primary education, Bremer attended Cretin High School in St. Paul, a Catholic boarding school and military academy. Bremer was an average student and displayed leadership, serving on the debate team and student council during his three years at Cretin. 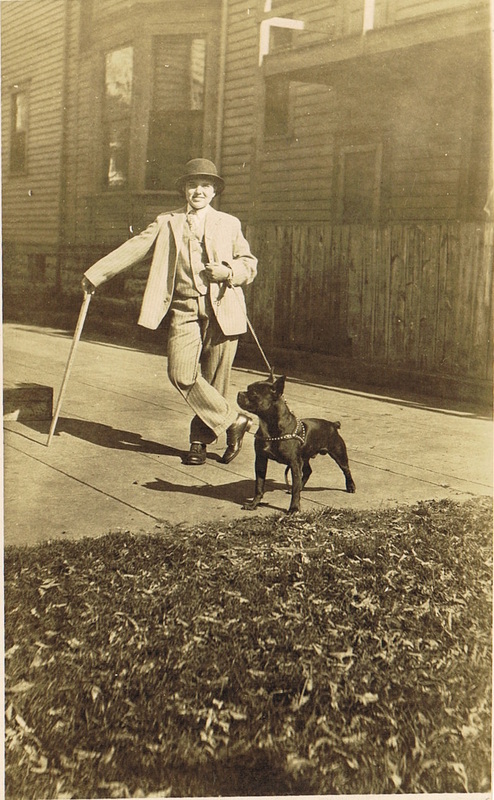 In 1930 Bremer dropped out of school to work and support his sister, Henrietta, with whom he was living amidst the economic conditions of the Great Depression. He worked various jobs as a credit clerk and warehouseman. In young adulthood, Bremer was somewhat of a wild card. He liked to dress as a gangster, enjoyed drinking and gambling, and occasionally cheated in games of cribbage amongst his pals to earn extra money. His marked cards accompanied him to England prior to his deployment to Normandy, France. He even experienced minor legal troubles that prevented him from serving until being pardoned by the governor of Minnesota. 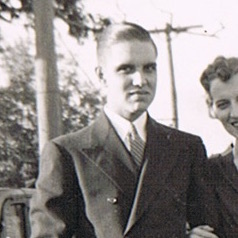 In 1937 his life gained new focus when he married Norma Schmuck, a native St. Paulite. Norma’s family welcomed Bremer, and he enjoyed being part of a busy, happy family that enjoyed fishing, hunting, and vacationing together at various Minnesota lakes. 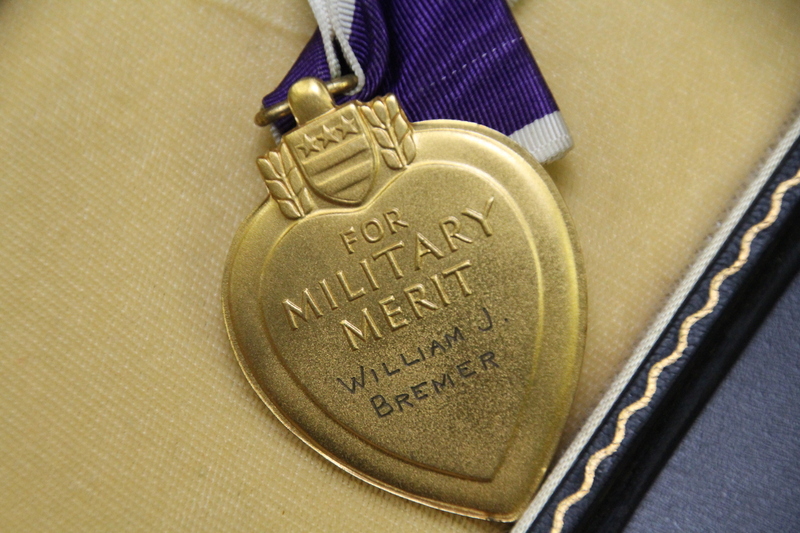 The Bremers did not have children before Bremer’s military service began. The Twin Cities area’s first focus during wartime was providing munitions. The Twin Cities Ordnance Plant (TCOP) in suburban St. Paul was a government-owned, contractor-operated, plant that employed local men and women to build, test, and sell military grade small arms ammunition. From 1942 to 1945, the plant made ball, armor-piercing, tracer, incendiary, and blank rounds for .30, .50, and .45 caliber weapons, including the blanks that Bremer fired in his basic training. The plant was personally inspected by President Franklin D. Roosevelt in 1942. The industrial war effort was also aided by the Ford Twin Cities Assembly Plant, located on the Mississippi River. The mostly female workforce built C-32 bombers, airplane engines, and gliders on conveyor belts stretching hundreds of feet long. In addition, light armored vehicles, T-17s and T-22s, were built on site for British and American forces. By 1942, production shifted to the M-8 “Greyhound” armored car, a combination tank and six-wheeled vehicle used for reconnaissance. The M-8 differed from the Sherman in that it was equipped with less armor and a much smaller 37-millimeter gun, but was twice as fast, capable of speeds of 65 miles per hour. Finally, Minnesota pioneered a series of food supply innovations. Despite being the home of major suppliers such as General Mills (Betty Crocker rationing cookbooks) and Hormel (producer of SPAM®), the greatest contribution was made by University of Minnesota Professor Ancel Keys, creator of the K-Ration. These boxed survival rations distributed to frontline military forces consisted of biscuits, dried meats, chocolate bars, hard candy, a stick of gum, two cigarettes, a pack of matches, toilet paper, and other variations based on the given ration. Professor Keys continued his government work and studied the effects of malnutrition and starvation on conscientious objectors to combat the growing fear of post-war domestic food shortages. Bremer reported to Fort Snelling in St. Paul, Minnesota at the end of September 1943 with mixed emotions. In the nearly 190 letters he sent to Norma Bremer between October 1943 and June 1944, Bremer was always anxious to hear from home, determined to excel in his training, yet disillusioned by the ongoing conflict that took him from his wife. On October 12, 1943, Bremer traveled to Camp Fannin, Texas for basic training at an Infantry Replacement Training Center. Bremer earned many leadership roles, including the title of squad leader and acting corporal. In his letters to his wife, he spoke of his favorite activities, particularly practicing on the shooting ranges. He was one of the best riflemen in his unit, earning the Sharpshooter classification and occasionally trained newcomers. He also cared for his M1 rifle so well that he was asked to loan it to his officers for their own evaluations. But Bremer often questioned the righteousness of the war effort, expressed frustration with the monotony of basic training, and missed home terribly. When Bremer joined his unit on June 24, the 8th Infantry Regiment was nearing the end of its drive northwest from Utah Beach to Cherbourg, a deepwater port critical to resupplying the Allied campaign in Normandy. When Bremer arrived at the front, the German strongholds of Montebourg and Valognes were destroyed. The enemy focused on defending the high ground outside of Cherbourg and destroyed the port’s infrastructure. As the 8th Infantry Regiment pushed to La Glacerie southeast of Cherbourg, they met heavy German defenses consisting of tunnels, dug outs, and 88-millimeter gun emplacements. [For] the average 8th Infantry foot slogger when he peered out of his foxhole or through a hedgerow, his disgust was profound. His body revolted at the thought of the increasing pace of the campaign and tenacity of the enemy. His mind was sick from the sight and smell of blood and death mingled with the damp earth about him. Yet his fighting spirit and sense of duty drove him on where further advance seemed impossible. It was during this conflict that artillery fire claimed the life of Bremer’s Battalion Commander, Lieutenant Colonel Conrad Simmons. On June 25, 1944 - Bremer’s first full day of action - the 8th Infantry Regiment, in anticipation of a German counter-attack, sent out small patrols to the northeast to eliminate scattered pockets of resistance. Although no enemy contact was reported and the 8th Infantry Regiment left action on reserve, Bremer and four other men were reported missing. He was found with a bullet wound to his back the next day, and buried in the temporary Sainte-Mère-Église Cemetery #2. Private William John Otto Bremer was like most soldiers during World War II. He never planned on being in the military, he thought he would never have to be. All he ever truly cared about was being home with his beloved family and friends. But even as he felt he had been stolen away from the only thing he loved, Bremer answered the call of duty with the understanding that he must serve to protect what he cared for most. His story has become a model for myself and my own aspirations for service in the United States military. Bremer, from the early days of his childhood, continuously overcame difficult situations. 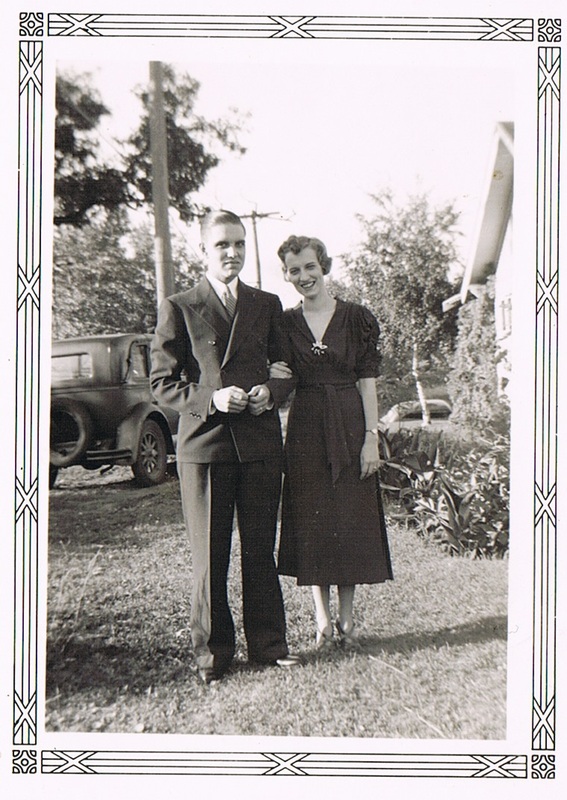 It was with this confidence in his ability to persevere that letters from home continued to ask after his well-being long after his death until late July 1944, when Norma discovered that her husband was M.I.A. On August 15, 1944, Norma’s 29th birthday, the news reached Minnesota that Bremer had made the ultimate sacrifice. Condolences from friends, relatives, and her own reflections, illustrated how Bremer’s legacy would persevere. The Normandy: Sacrifice for Freedom® Albert H. Small Student & Teacher Institute experience has opened my eyes to the other parts of the world. I grew up in the same rural area that I am still living in today. Of course with media, one is able to view many parts of the world. I have always believed that it is more important to do this with your very own eyes, especially when it comes to international travel. With that, the pressures of going to France became even greater for me after meeting Douglas Harper. Mr. Harper is the son of our Silent Hero’s widow from her second marriage, and a critical source of information in telling Private Bremer’s story. He told me many stories of his international travels, including through Normandy, and the people he met, making me more anxious to get to France. After almost a week with each other in Maryland, we left the states for France with one suggestion, to sleep on the plane as much as possible. I ended up being the only one awake the entire time as I could not sleep at all; I was too excited. We landed in France, and I felt as if I was on an alien planet, but at the same time, home. The landscape was not what I was expecting. It was gloomy, seemed to have a grey color, and was cold. Being from Minnesota, I know cold, but this was different. I much preferred the countryside of France. The hills and farmland were some of the most beautiful sights I have seen alongside the beaches of Normandy. The Institute experience has been a once in a lifetime event for me. I was able to learn so much about the places we traveled, and my eyes were opened to what it was really like in different areas of the world, compared to what I had imagined. 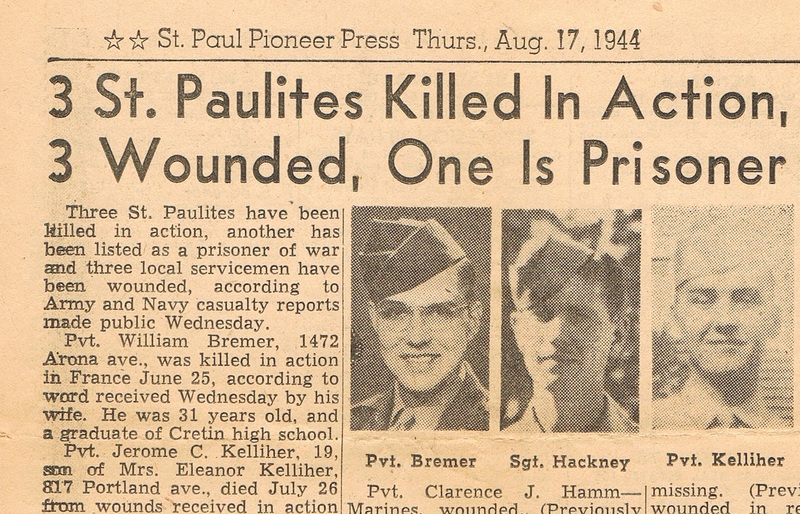 “3 St. Paulites Killed In Action, 3 Wounded, One Is Prisoner.” St. Paul Pioneer Press. August 17, 1944. “4th US Infantry Division: Invasion of Normandy.” Directed by Tyler Alberts. 1944. Fort Worth: Combat Reels, Inc., 2014. DVD. Alida Knoll, e-mail message interview by Christopher Stewart. May 28, 2017. “Cherbourg Due to Fall Today” St. Paul Pioneer Press. June 22, 1944. Cretinite, The. Saint Paul, MN: Cretin High School, 1928. Cretinite, The. Saint Paul, MN: Cretin High School, 1929. Cretinite, The. Saint Paul, MN: Cretin High School, 1930. Death Certificate for Augusta M. Bremer. October 18, 1951. File Number 9879. Minnesota Department of Health Division of Vital Statistics. Death Certificate for Charles John Bremer. April 26, 1940. File Number 24654. State of Minnesota Division of Birth and Death Records and Vital Statistics. Death Certificate for Henrietta H.I. Bremer. August 16, 1976. File Number I-22-76-024054. Minnesota Department of Health Section of Vital Statistics. Death Certificate for Sophia H.K. Bremer. April 26, 1940. File Number 22704. State of Minnesota Division of Vital Statistics. Eisenhower, Dwight D. Crusade in Europe. Baltimore: The Johns Hopkins University Press, 1997. Galvin Jr., Captain John E. “(S-1) Period Reports May 1 1944-July 1, 1944.” 4th Infantry Division Headquarters. United States Army. Courtesy of Bob Babcock. Harper, Doug. Interview by Christopher Stewart and Evan DuFresne. April 21, 2017. Harper/Bremer Family Photographs. 1935-1944. Courtesy of Douglas Harper. “Interment Record for WIlliam J. Bremer.” U.S., Headstone and Interment Records for U.S. Military Cemeteries on Foreign Soil, 1942-1949. Digital Images. http://ancestry.com. Letters from William Bremer to Norma Bremer, October 1943-June 1944. Courtesy of Douglas Harper. Letters from William Bremer to Schmuck Family, 1943-1944. Courtesy of Douglas Harper. Letters of condolence to Norma Bremer, July 1944-August 1944. Courtesy of Douglas Harper. “Obituaries.” St. Paul Pioneer Press. August 24, 1944. Military service documents (assorted) of William Bremer, 1942-1944. Courtesy of Douglas Harper. Minnesota. Ramsey County. 1920 U.S. Census. Digital Images. http://ancestry.com. Minnesota. Ramsey County. 1930 U.S. Census. Digital Images. http://ancestry.com. Minnesota. Ramsey County. 1940 U.S. Census. Digital Images. http://ancestry.com. Parish Directory. Minnesota Historical Society Pamphlet Collection. Saint Paul, MN: Saint Peter’s Episcopal Church, 1932. “Pvt. William J Bremer.” Find A Grave Index. August 8, 2010. https://www.findagrave.com/cgi-bin/fg.cgi?page=gr&GRid=56642646#. Record of Credits for William J. Bremer. 1928-1930. Cretin High School, St. Paul, MN. Rodwell, Colonel J.S. “Action Against Enemy, Reports After/After Action Reports, Period 15 May-3 July 1944.” 8th Infantry Regiment Headquarters. United States Army. Courtesy of Bob Babcock. “S-1 Journal for 8th Infantry Regiment, 4th Infantry Division, May 16, 1944-June 1944.” 8th Infantry Regiment Headquarters. United States Army. Courtesy of Bob Babcock. U.S. City Directories. “St. Paul, Minnesota, City Directory, 1944.” Ancestry.com. https://www.ancestry.com/sharing/11217795?h=6dd535, 130. William J. Bremer. Individual Deceased Personnel File, Department of the Army. Atkins, Annette. Creating Minnesota: A History From The Inside Out. St. Paul: The Minnesota Historical Society Press, 2007. Babcock, Robert. War Stories Volume 1: D-Day to the Liberation of Paris. Athens: Deeds Publishing, 2014. Ball, Janet. The Minnesota Starvation Experiment.” BBC World Service. Last modified January 20, 2014. Accessed August 14, 2017. http://www.bbc.com/news/magazine-25782294. Bloom, Molly. “Photos: Twin Cities Streets At The End of the Depression.” MPR News. Last modified May 20, 2015. Accessed August 14, 2017. https://www.mprnews.org/story/2015/05/20/vachon. Blumenson, Martin. Breakout And Pursuit. Washington, D.C.: U.S. Army Center of Military History, 1993. http://www.history.army.mil/html/books/007/7-5-1/CMH_Pub_7-5-1_fixed.pdf. “The Focus on Food.” The Greatest Generation Exhibit. Minnesota History Center, St. Paul, MN. Harrison, Gordon. Cross-Channel Attack. Washington, D.C.: U.S. Army Center of Military History, 1993. http://www.history.army.mil/html/books/007/7-4-1/CMH_Pub_7-4-1.pdf. Kenney, Dave. Minnesota Goes to War: The Home Front During World War II. St. Paul, MN: The Minnesota Historical Society Press, 2009. “Key Figure in Drive to Fund FL Hospital Dies.” Forest Lake Times. February 6, 2008. “K-Rations.” The Greatest Generation Exhibit. Minnesota History Center, St. Paul, MN. Magliocco, Jo. “Most People Have Never Seen These 19 Photos Taken During WWII In Minnesota.” Only In Your State. January 13, 2016. http://www.onlyinyourstate.com/minnesota/world-war-2-photos-mn/. Magliocco, Jo. “23 Rare Photos Taken in Minnesota During The Great Depression.” Only In Your State. 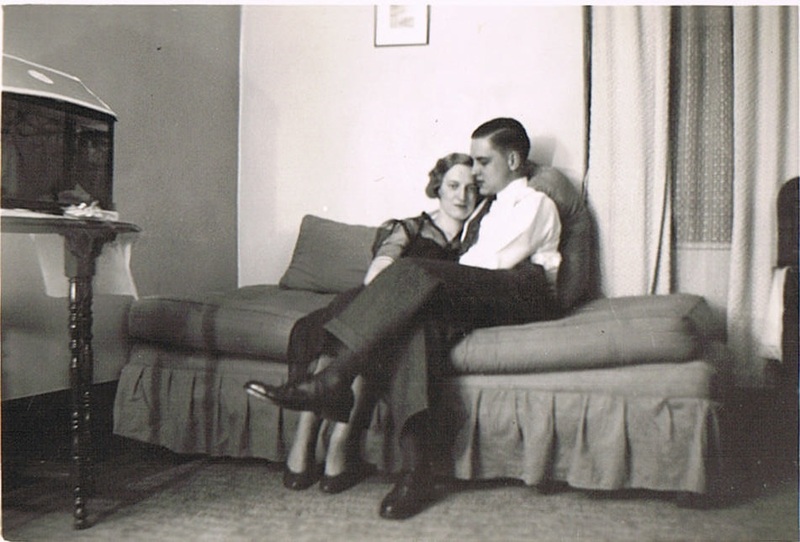 December 14, 2015. http://www.onlyinyourstate.com/minnesota/great-depression-mo/. McMahon, Brian. “Production for Victory: The Ford Twin Cities Assembly Plant in WWII.” Ramsey county History, Fall 2016, 18-24. “Norma Harper Obituary.” Pioneer Press. January 27, 2008. Robert Babcock, e-mail message interview by Christopher Stewart. March 9, 2017. Terkel, Studs. The “Good War:” An Oral History of World War II. New York: The New Press, 1984. Utah Beach to Cherbourg: 6-27 June 1944. Washington, D.C.: U.S. Army Center of Military History, 1990. http://www.history.army.mil/html/books/100/100-12/CMH_Pub_100-12.pdf. 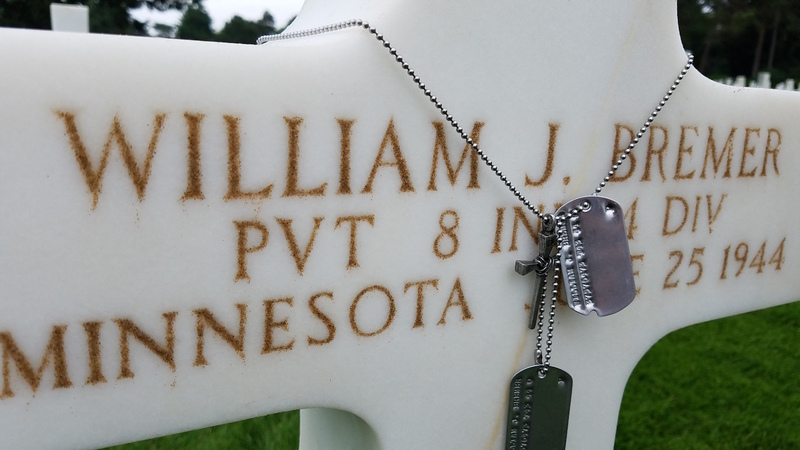 “William J. Bremer.” American Battle Monuments Commission. January 15, 2017. https://www.abmc.gov/node/407184#.WWZudNMrLdQ. Weinberg, Gerhard L. World War II: A Very Short Introduction. Oxford: Oxford University Press, 2014. “World War II (1941-1945).” Minnesota Historical Society. http://www.historicfortsnelling.org/history/military-history/world-war-ii. Wurzer, Cathy. “Minn. Companies Helped Fight WWII in Surprising Ways.” MPR News. June 16, 2010. Zimmerman, Dwight. “A War Won With Spam (and a Few Other Things).” Defense Media Network. Last modified May 19, 2011. Accessed August 14, 2017. http://www.defensemedianetwork.com/stories/war-won-spam-things/.